Happy Friday! TGIF! I've been working late nights all this week...then coming home to packing and moving into the new apartment. My BF and I have been moving till midnight each night...talk about exhausted! Hopefully we can finish moving into the new place by this weekend. Combined with that, I've had the worst allergies ever...my skin is reacting still to an allergic reaction to products, and my eyes are super red...so sorry, no tutorials until I recover, I would just scare you all! I've had this product for a while and am just now getting to posting it. I usually just review makeup and skincare, but I recently had the opportunity to try out the new Gillette Venus Embrace Razor. 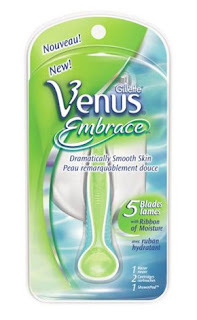 I've always been a Gillette Venus girl, it's the only brand I used...so I was excited to try out the new Venus Embrace. Not to generalize, but most of us do need a little help in the hair department...by hair I mean unwanted hair, lol. Now that Spring is here, it's time to get my legs out of hibernation and break out the new razor. I'm guilty of holding onto a razor for way too long, my boyfriend calls me out on it for a daily basis. I was so happy to have a bright and shiny new Venus Embrace razor. -Two moisture strips keep your legs super moisturized. -Suction Cup holder keeps the razor within an arms reach in the shower. What are you waiting for? Go pick it up at your closest drug store. thanks for the review! 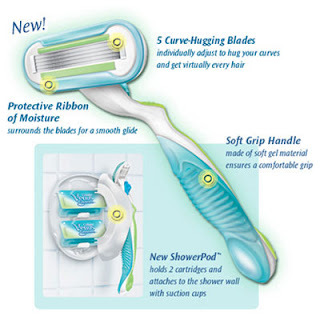 What do you think is the biggest difference between this and other venus razors? 5 blades now? LOL! yeah I like the venus too, i have the one that vibrates for an even closer shave. yeah its time to take those hibernating hairy legs out and remove the hair cause its skirt wearing season! I'm always in search of a good razor. i've always been a fan of venus too. thanks for the review. i'll be sure to check it out. anything that cuts shaving time is good. i LOve your purple looks! i know i already told u this before.. i love purple on you!! I got this on Tuesday and I love it. I have always used the regular venus and will definitely be switching to this one! I love this razor too! Such a close shave that you only have to go over each area once!